Andrew Mitchell celebrates a goal with Glenavon manager Gary Hamilton. Pic by Inpho. Home comforts have helped Andrew Mitchell maintain his scoring momentum as the Irish League’s most prolific striker following a summer switch to Glenavon. 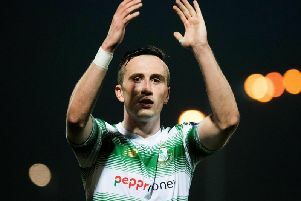 Mitchell arrived as the club’s most high-profile addition with the weight of expectation following a season spent as the leading forward in the Danske Bank Premiership during time at Dungannon Swifts. His return to Mourneview Park - having left the club he supports to develop at senior level - came with the burden of responsibility given a Glenavon summer budget restricted by the lack of European football finances. A brace last weekend in the 4-0 defeat of Ballymena United pushed Mitchell’s league tally into a dougle-figure mark, with manager Gary Hamilton attributing the forward’s form to a comfort level with club life alongside natural talent. “It can be a challenge making a move to a new club but, of course, Andrew was with us before so knows all about how we work and what we want to achieve,” said Hamilton. “Plus, he came up alongside some of the younger players, so that also helps him adjust. “To be honest, the pressure was never on Andrew to replicate his form from Dungannon, the pressure was on the rest of the team to provide the service. “As a proven scorer, his ability to put the ball in the net was never a doubt for me. “He is sitting on 10 goals in 11 appearances, plus five or six assists. “I’ve said before we would have qualified for Europe and won a trophy if Andrew had been in the squad last season. “We have a poor record away to Carrick so need to continue to put in the hard work. Across a season of inevitable highs and lows, Carrick Rangers manager David McAlinden is searching for the sense of perspective he considers crucial to survival. Rangers host high-flying Glenavon tomorrow aiming to make amends for the previous weekend’s setback by Ballinamallard United - a performance McAlinden considered the “worst of our season”. “I would never be happy accepting a result like the Ballinamallard game but the key is how we respond to setbacks so one bad result doesn’t turn into a run,” said McAlinden. “There’s nothing we can do now about Ballinamallard so it comes down to the mental strength to move forward and bounce back. “Ultimately we will - and should - be judged on our league form but I always try to be honest and aware there are going to be ups and downs.